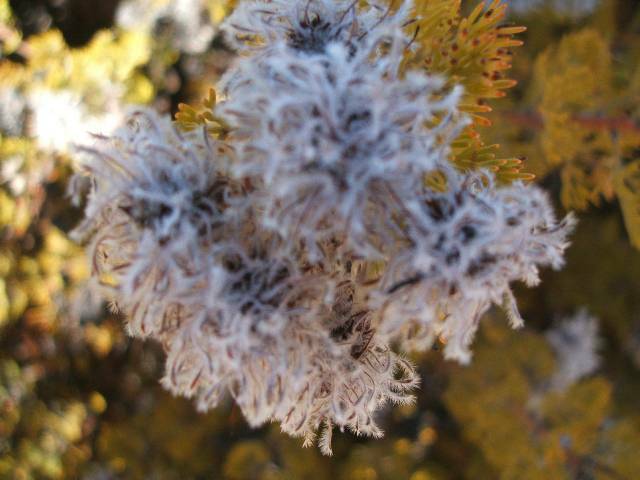 Photo captions by my daughter Dr Nicky Allsopp, a botanist in Cape Town, who accompanied me on the walk. 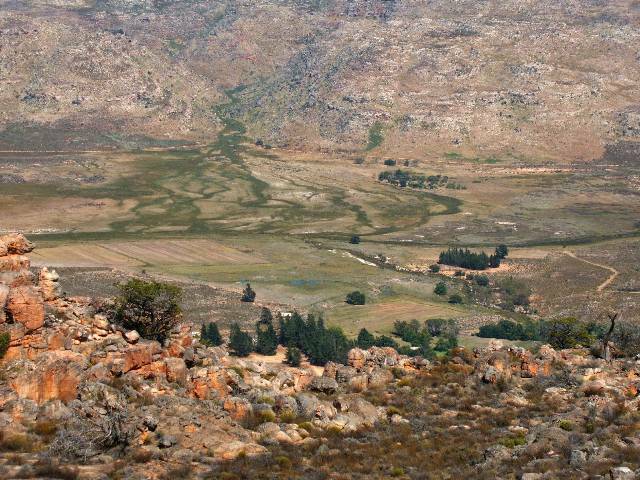 View of Driehoek farm in the broad Cederberg valley. 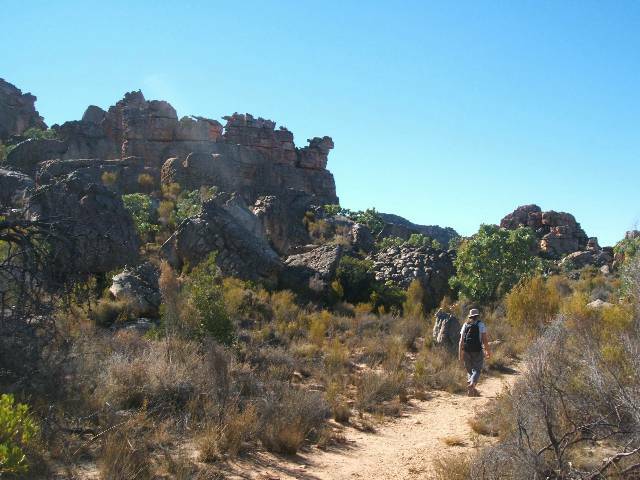 The Cederberg is a wilderness area with areas under strict conservation, private farms, and a communally managed part. Cedar trees, alive and dead, Widdringtonia cederbergensis. 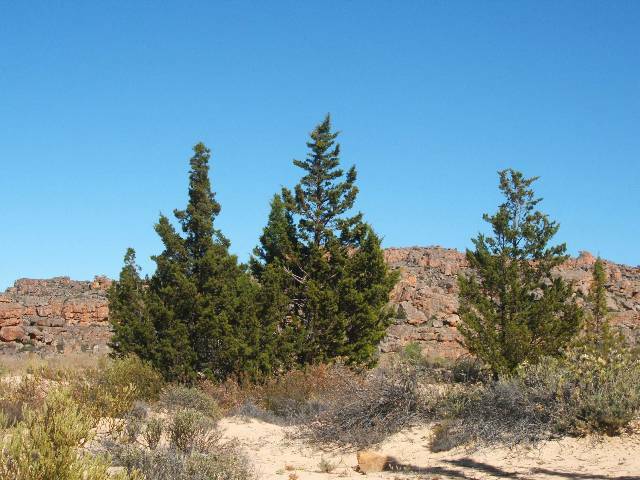 These are the biggest trees in the Fynbos proper. They may live 600-1000 years. 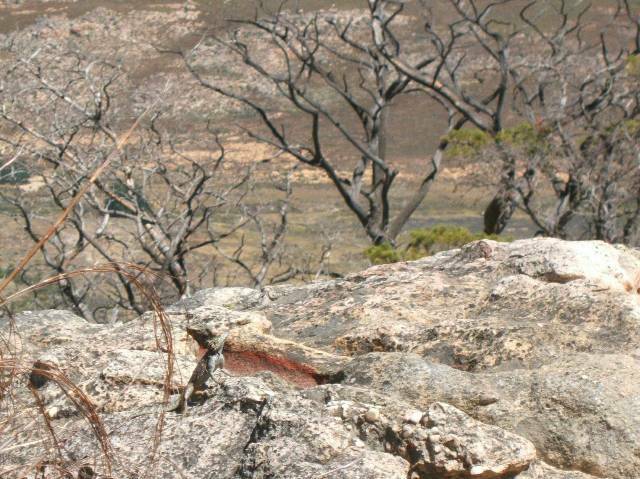 Fires often kill all or part of a tree. Even dead trees still have wood which smells of cedar. 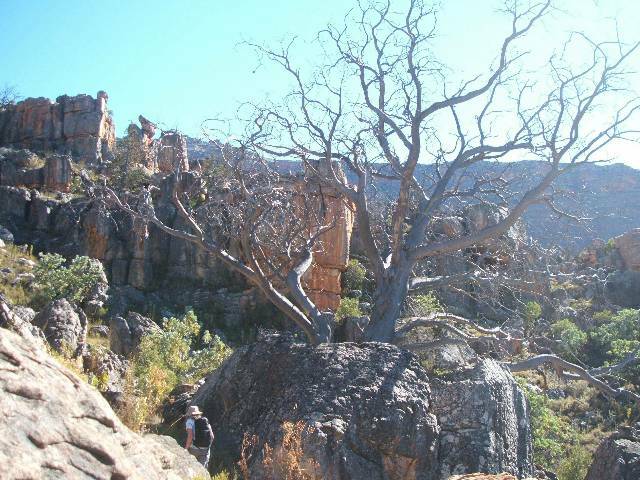 It seems that the impact of climate change, increasing drought and higher temperatures might be spelling the death knell of these trees. Their natural distribution nowadays is restricted to a narrow (50 m) band of rock, the Pakhuis formation. 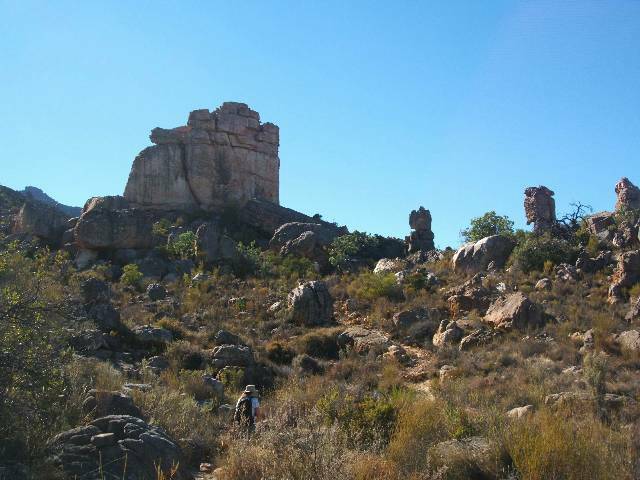 The Cederberg is made up of rocks of the Table Mountain Group. 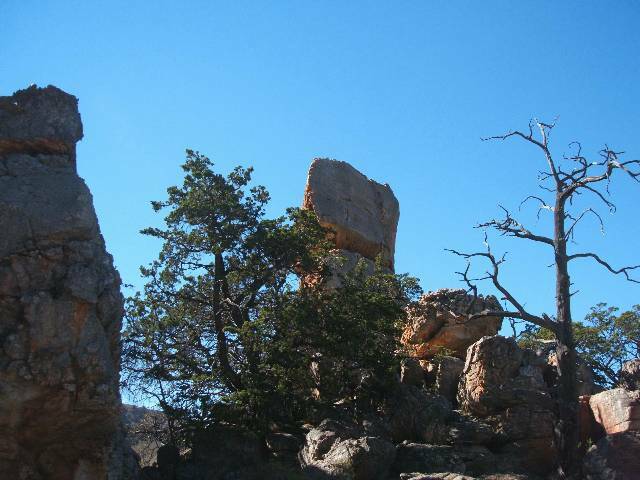 These are sedimentary rocks, mostly very hard quartzitic sandstone. 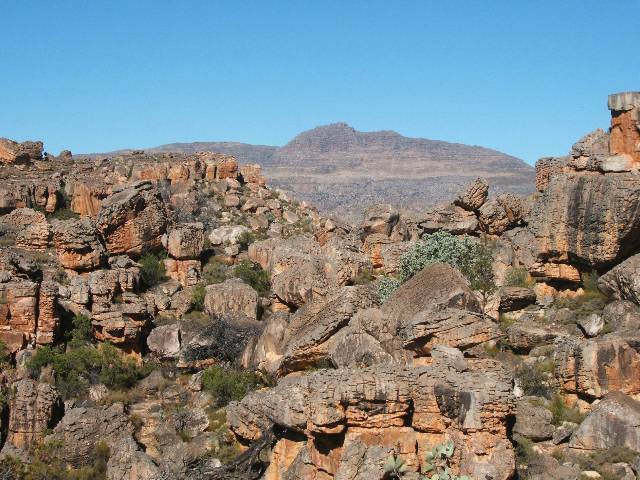 The top two layers have been eroded away (in the Cederberg) and we are left with the Nardouw formation on the top of mountains, a layer of Cederberg shale which is up to 150 m thick, and below this the thin Pakhuis formation and Peninsula formation. 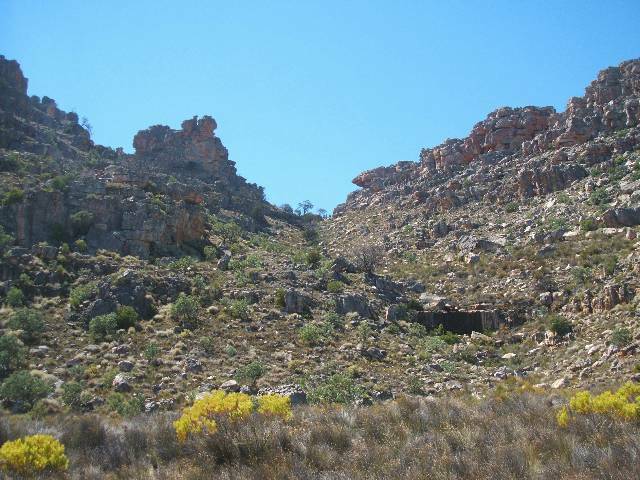 The Cederberg shale formation erodes away leaving a flatter area between the steeper cliffs of the Nardouw and Pakhuis formations . 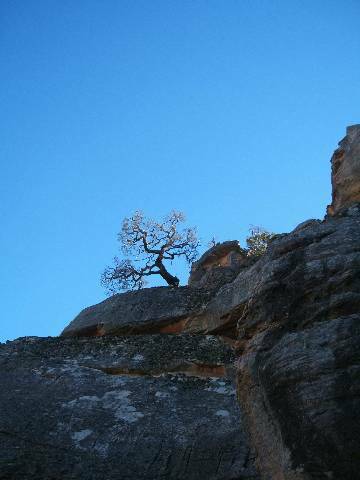 All the formations except the shale layer provide good, solid rock climbing. 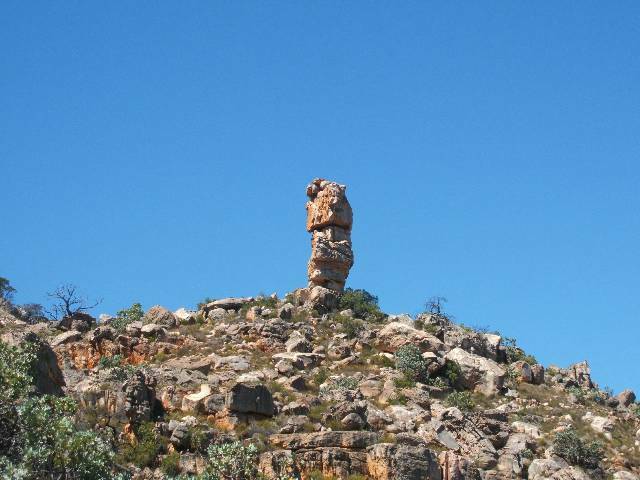 The strange gargoyles and pillars in the Cederberg are the result of wind erosion. 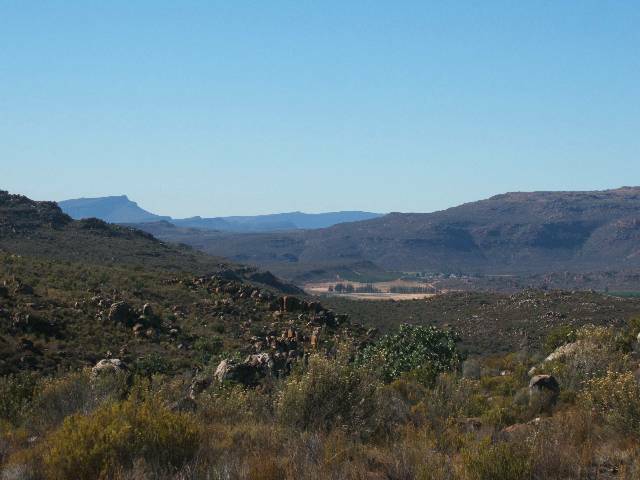 In the background is Sneeuberg, the highest mountain at 2026m in the area. 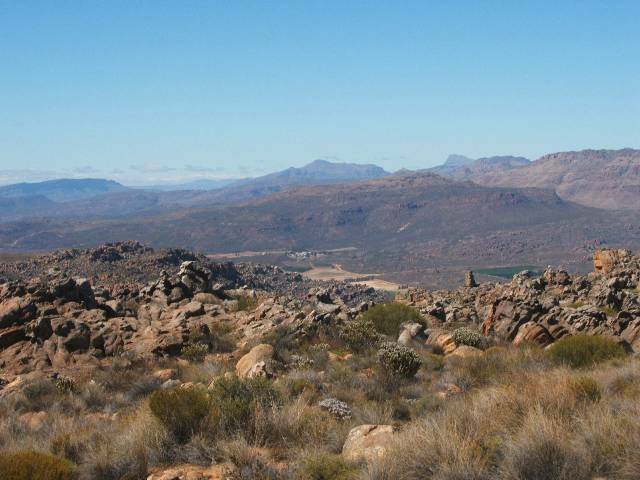 The grassy portion just visible in the Sneeuberg picture is the shale layer below the top Nardouw layer. 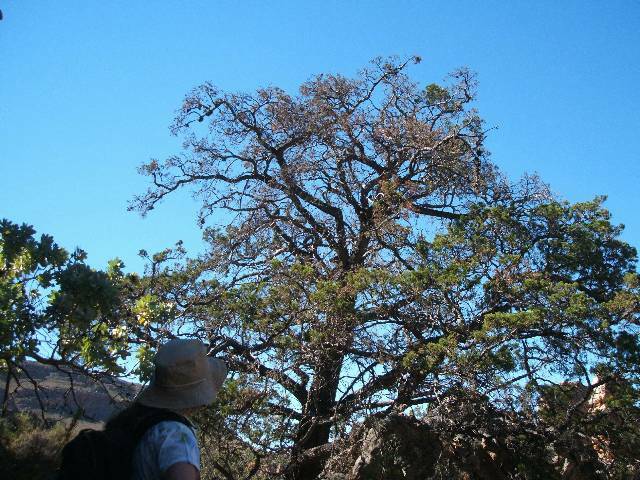 This is a Waboom or Protea nitida - the largest “tree” next to the cedar tree in the Fynbos. 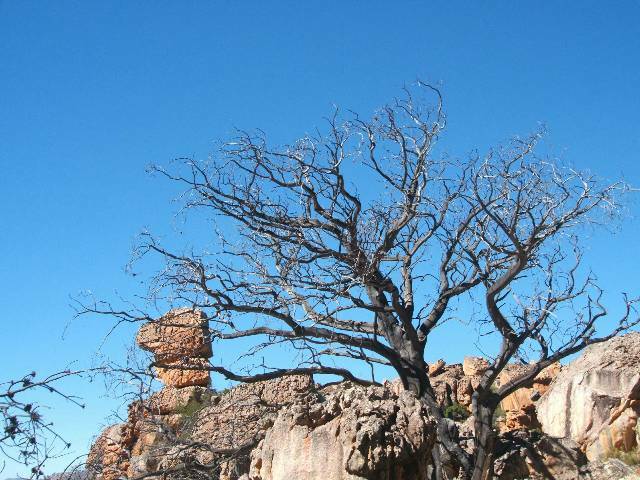 It can achieve this height by having thick, fire resistant bark, which allows it to re-sprout leaves form its trunk and branches after the 5-15 year fire cycles that occur naturally in the Fynbos environment. 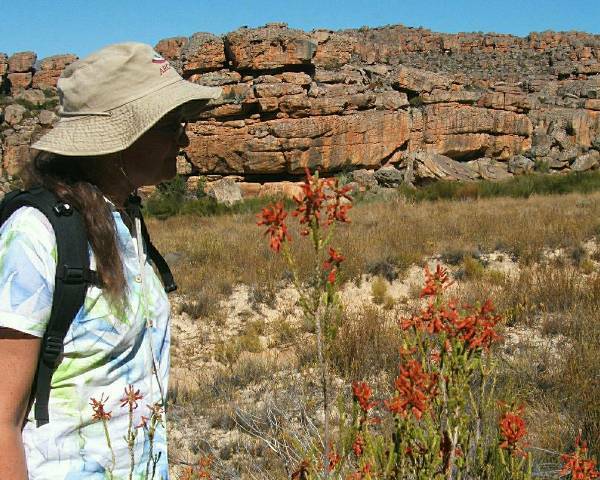 Proteas are typical of Fynbos, which is a vegetation type adapted to the very nutrient poor soils derived from the Table Mountain group of rocks. 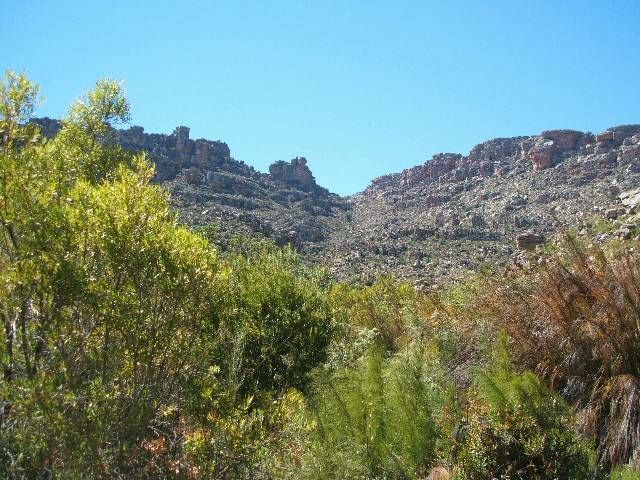 Fynbos itself is part of the Cape Floristic Kingdom, one of the six floral kingdoms of the world, which is restricted to the SW part of South Africa. The wood of the Waboom was originally used to make the brake shoes for wagons. 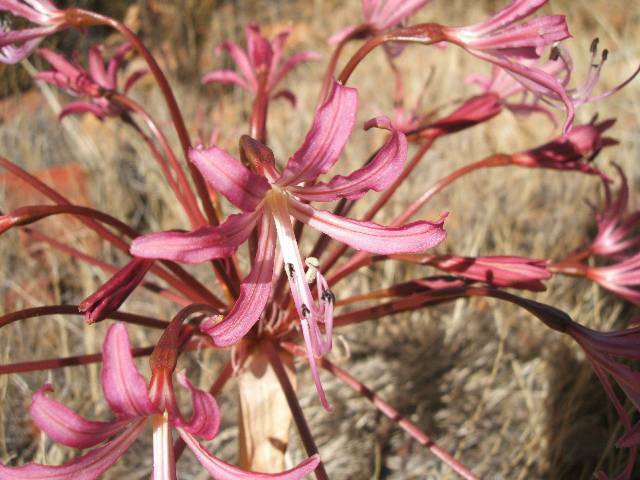 Inflorescence of Brunsvigia, one of a cohort of red flowering bulb species that flowers in autumn (March - May) in the Cape Floral Kingdom. This one is related to the Amaryllids. 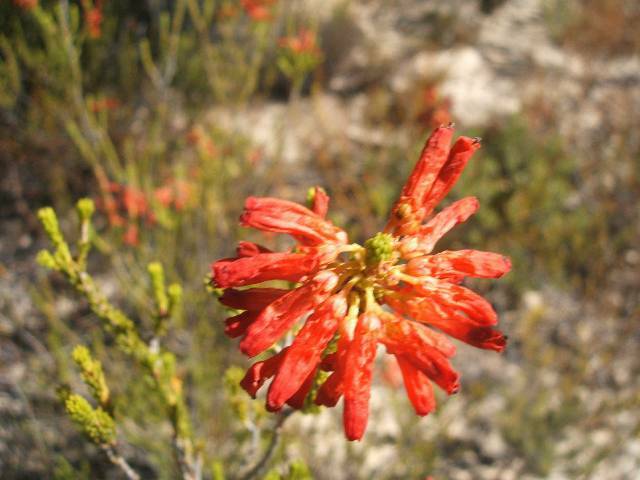 Their leaves are produced in the wet winters (June - Sept) and the bulb stores the energy and water needed to produce the flower in the hottest and driest part of the year. 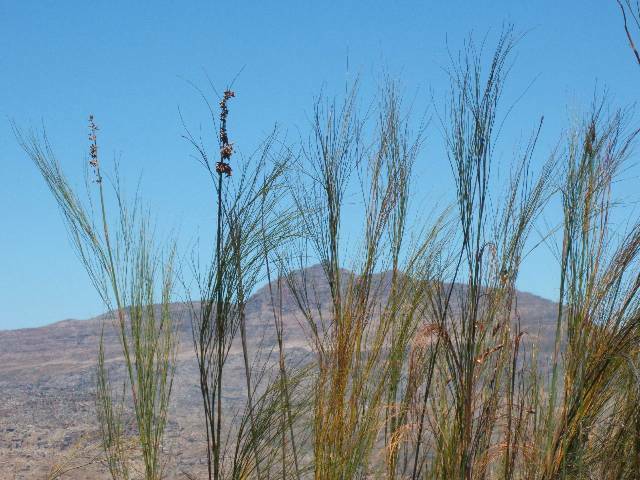 The seeds of Brunsvigia need to germinate shortly after ripening, as the winter rains begin, and cannot be stored. The flower head tumbles in the wind dispersing the seeds away from the mother plant. Erica verecunda. Erica species are another species typical of Fynbos, there are over 660 species of Erica in the Cape Floristic Kingdom, the UK only has four. Remnants of a plantation of cedars planted by The Department of Forestry to “save the cedar”. Most of these plantations are outside the Pakhuis formation zone, and eventually succumb to drought and fire. 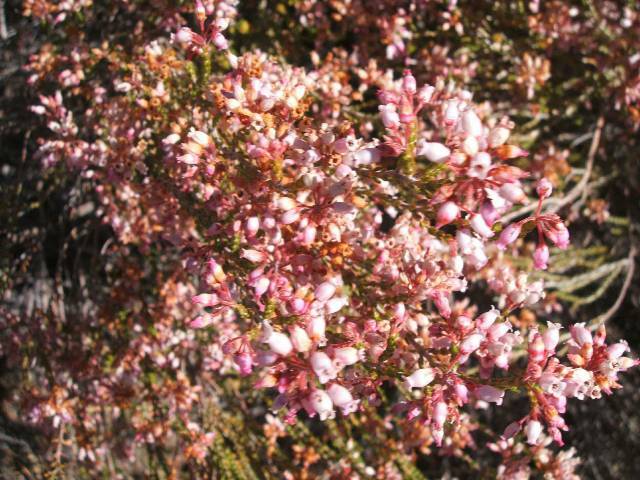 Erica mammosa. One of the few widespread species of Erica. 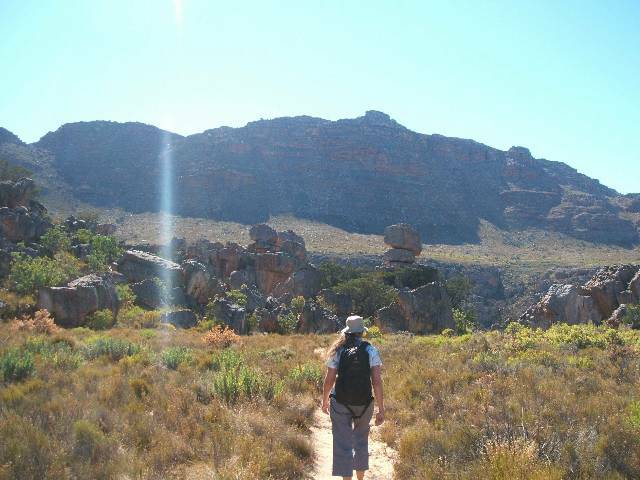 Most have narrow distributions in the Fynbos. Pink and white variants of E. mammosa are also found. This is a Phylica species. 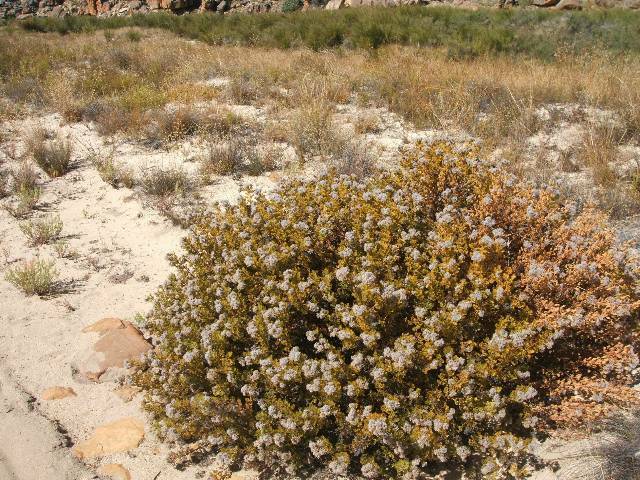 This genus is also typical of Fynbos. It has hard dark myrmecochorous seeds. That is seeds designed to be dispersed by ants. Ants are attracted to an oily elyasome or cap on the seed and carry the seed back to their nests where they harvest the elyasome. The seeds will only germinate if they are abraded or heated. 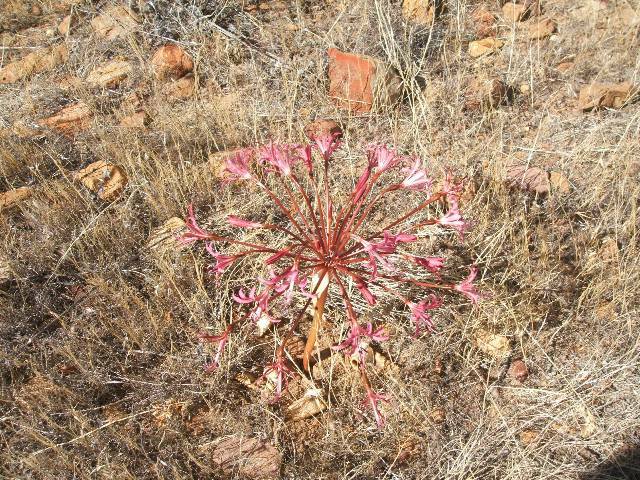 This is a mechanism common to many Fynbos species that are programmed only to germinate after fires. Horticulturalists have discovered that many species that were impossible to grow, will germinate if exposed to smoke, or extract of smoke. 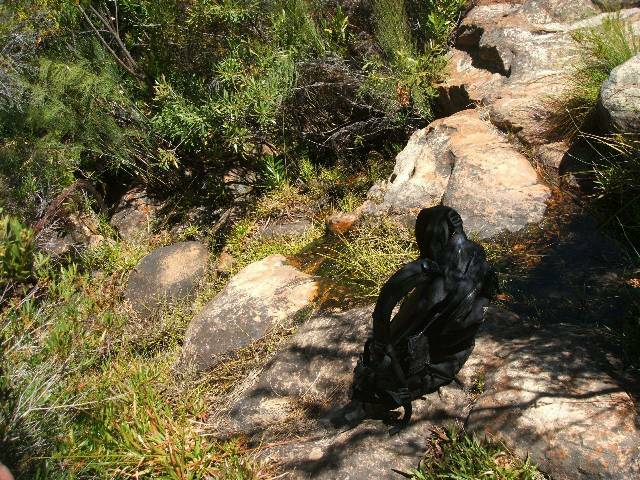 General view on left - on right is a view of a wetland (the dark green in the background a year or so after a fire). 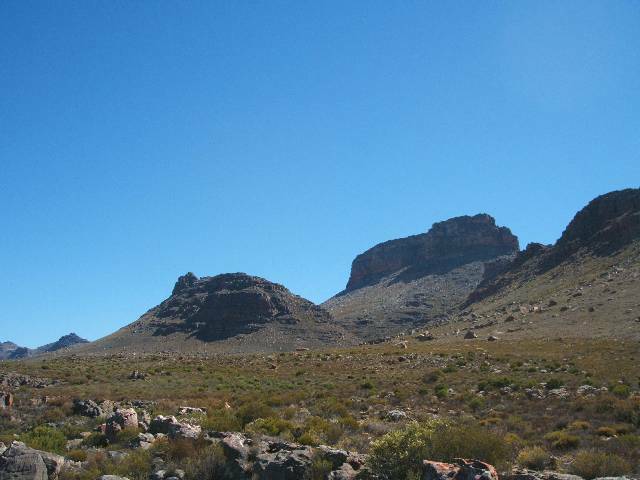 On left a rock formation with cedars, on right Tafelberg (1968 m) and Consolation Peak. 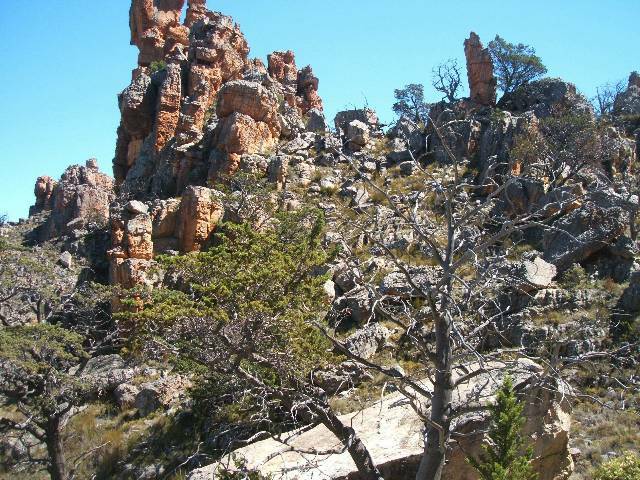 The top of Tafelberg is made up of the Nardouw formation and has excellent rock climbing. 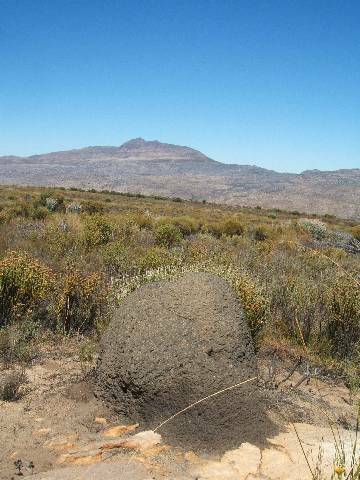 Termite heap with Sneeuberg in the background. A restio. 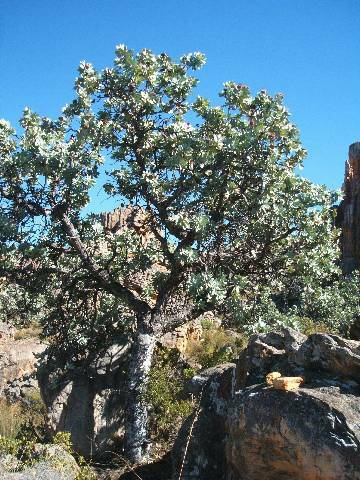 The species in the Restionaceae are also typical of Fynbos. 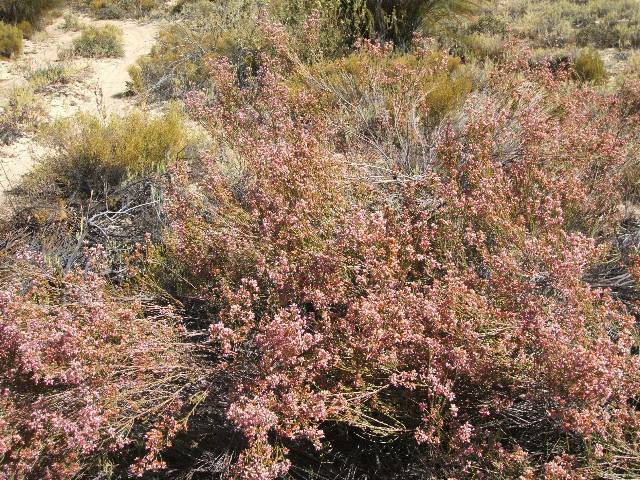 Other members of this family are found on the southern tips of Australia and South America on poor soils. So they were in existence before Gondwanaland split up. They are the equivalent to grass in Fynbos. 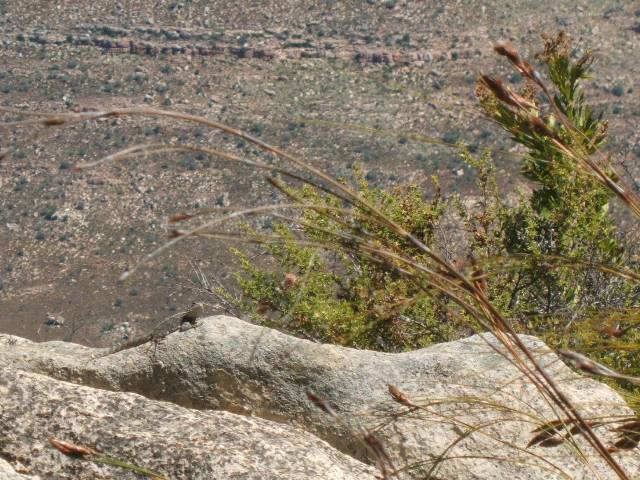 Grasses tend to be scarce in Fynbos because they need a reasonable supply of nutrients to grow new leaves every year or so. Gabriel pass, a donkey track form De Rif farm over to the Wupperthal communal lands. 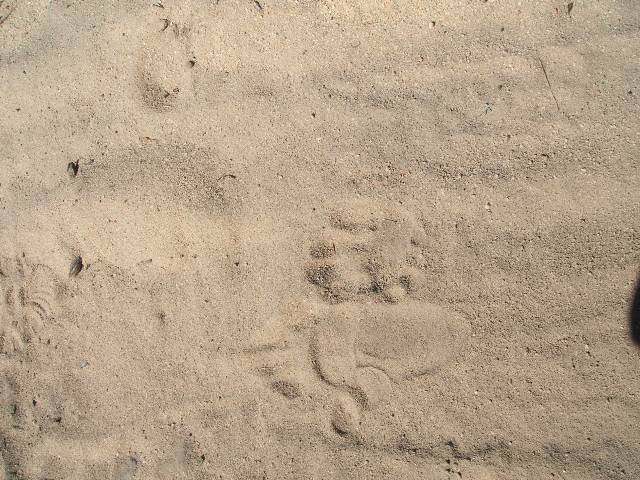 These paths were the trade routes of the area before motorised vehicles and roads. on left wind worn rock - on right wetland on the shaleband below Gabriel pass. 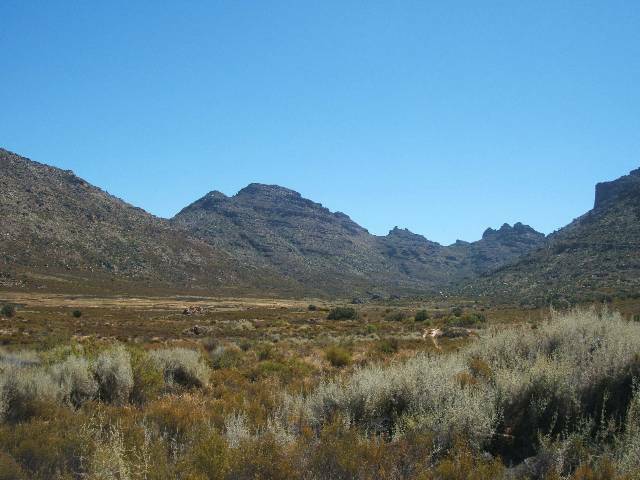 on left Welbedacht stream with small rucksac, on right Old Welbedacht farm looking towards Uitkyk.